* Claudia and Marlon are fictitious names, but the story is real. Claudia was hardworking, independent, ambitious and outgoing. She knew what she wanted. If she went after something, she’d get it. She made friends easily. She exuded life. She was married to Marlon for eight years. He was the opposite of her in many ways. He was even-tempered, peaceful and prudent. He never had to fight for survival because he was born into a wealthy family. He was reserved and did not have many friends. He was a man of few words—and sometimes melancholic. What they saw in each other to fall in love and get married is something that only love can explain. What matters is that they were happy. Until the day she cheated on him. Her lover had characteristics that she unconsciously wanted her husband to have. Security, persistence, romance, pleasant talk. They met at work. She allowed herself to get involved with him. In a “let it go” moment, she went to bed with him. Once. Her conscience would not let her continue. Feeling sorrowful, she confessed everything to her husband. There is no doubt that the most fundamental reason why a person is unfaithful is a character flaw. But what human being has an inviolable character? “Everyone has their price,” they say. Given the circumstances, everyone is capable of lying, being dishonest, taking advantage of others or being unfaithful. Perfection of character is only possible when a person is in perfect communion with God. And if there is something that can disrupt this communion, it is a problem in the love life. “Love is strong as death,” said King Solomon, whose wisdom and fear of God were canceled out by his passions. We must learn to admire what we have. No human being has all the good qualities. They will always have some and lack others. Claudia married Marlon because he had good qualities, but she stopped admiring him when she realized he lacked some other qualities. You have to admire the qualities your partner has and who he is; always focus on that. We must learn to live without what we don’t have. When you say “yes” to someone and marry him or her, you are saying “no” to everyone else. You agree to never have someone else give you the affection you need. For example, if your partner is not romantic, you will have to diminish the importance of romance in your life. We have to beware of dangerous situations. 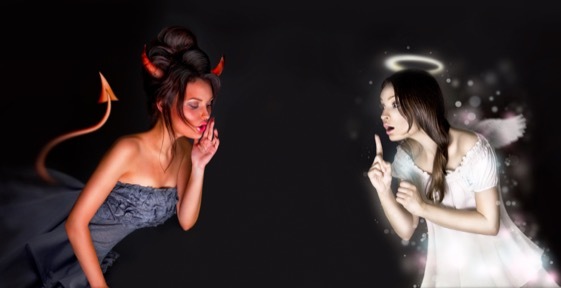 We all have a little angel on the right shoulder and a little devil on the left one. If you find yourself in a tempting situation, next to someone who seems to have the qualities that you miss in your partner, that little devil will speak insistently in your ear. It’s up to you to silence him. Run away. Avoid that person. Minimize contact if you cannot avoid them completely. Never be alone together. Don’t have personal conversations—whether in person or by phone or messages. No compliments or smiles. Claudia failed in all these points. Your personality is not an excuse for not improving. Marlon will never stop being Marlon, but that doesn’t mean he cannot improve… and strive to surprise his wife from time to time, show interest in her, not leave any gaps in the relationship, not neglect his marriage, learn to express himself better when talking to his wife, go easy with his melancholy… If we do not improve in life, there is a great chance of us being overshadowed and overtaken by someone better. Claudia and Marlon are trying to overcome the tragedy that rocked their marriage. If they do the right thing, they may come out of it stronger and be happier. But the scar will always be there, as a reminder of their mistakes—mistakes you don’t need to make to learn these lessons. Learn from theirs.